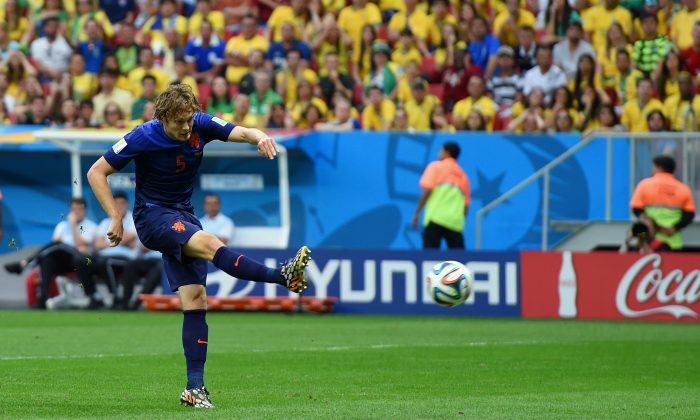 Daley Blind scored in the 16th minute for Netherlands against Brazil. Brazilian defender David Luiz headed a cross right in the path of Blind, who scored easily. It was Blind’s first international goal. RIO DE JANEIRO (AP) — Marcelo looked wide-eyed, stunned when he scored the first goal of the World Cup … against his own team. Hardly the most auspicious of starts for Brazil. But that blooper just 11 minutes into the tournament was soon forgiven and forgotten as Brazil went on to win that opening game and the 2014 World Cup quickly flowered into a roaring success, confounding doom and gloom merchants who predicted Brazil couldn’t pull it off without major protests and problems. The stadiums were (just about) ready in time. Airports held up under the strain of fans and teams crisscrossing South America’s largest country. Players came ready to rumble, well prepared for hot conditions. Coaches embraced positive and ambitious tactics. Costa Rica beating four-time champion Italy and two-time champion Uruguay on a white-knuckle ride to the quarterfinals exemplified how supposedly “small” teams showed no fear of illustrious opponents. Shockingly in some instances of violent and reckless play, referees showed fewer yellow and red cards per game than at any World Cup since 1986. Their leniency, letting play flow, and team tactics of forward-minded, attacking football and quick counterattacks produced exhilarating and engrossing end-to-end games and what will be a record goals tally if Germany and Argentina in Sunday’s final and Brazil against the Netherlands in the third-place match score five more. It was surreal, and one of the biggest shocks in World Cup history. NEYMAR KNEED: One of the greatest injustices of the World Cup was Spanish referee Carlos Velasco Carballo letting play run on as Neymar howled in agony face down in the turf, his third vertebra fractured. Neymar later said he could have been paralyzed had the knee to his lower back from Colombian defender Juan Camilo Zuniga hit two centimeters (less than an inch) closer to his spine. The injury in the quarterfinals put the 22-year-old out of the only World Cup he’ll ever play on home soil and robbed the tournament of its Brazilian superstar. Without its best player, the Brazil team was destroyed by Germany. HUNGRY FOR ITALIAN: Luis Suarez likes a varied diet. Having previously been banned for biting a Dutch player (Otman Bakkal) and a Serbian (Branislav Ivanovic), Suarez seemingly hankered for Italian at this World Cup. Sinking teeth into the shoulder of Giorgio Chiellini in a group-stage game led to a four-month ban from all football for the Uruguay striker. Deprived of his goals, Uruguay crashed out of the first of the knockout rounds. Initially, Suarez professed innocence. He returned home to an outpouring of support. Uruguay’s president, Jose Mujica, was highly critical of FIFA. Suarez then did a U-turn and apologized to Chiellini for the bite seen on TVs and talked about around the world. Social media wits and marketers made hay. A photo of a chocolate bar with a Suarez hashtag and the words “more satisfying than Italian” got more than 48,000 mentions on Twitter. COSTA RICA’S KRUL FATE: With the Netherlands and Costa Rica scoreless after 120 minutes, Dutch coach Louis van Gaal made an astounding call in the final seconds of their quarterfinal: He replaced his first-choice goalkeeper with his understudy, Tim Krul. Taller, with a longer reach and prepped for this eventuality, Krul then saved Costa Rica’s second and fifth penalties in the ensuing shootout, and guessed the correct way on all five. The masterstroke made Van Gaal look like a football genius, whetting the appetite of fans of Manchester United, his next stop as coach. ROBIN FLIES LIKE BATMAN: James Rodriguez’ volleyed goal for Colombia against Uruguay, controlling the ball with his chest, letting it drop and then hammering in with his left foot, all while turning to face goal, was poetry, the timing exquisite. It will be many fans’ goal of the tournament. But Robin van Persie’s diving header that foretold the demise of reigning world champion Spain was spectacular, too. He launched himself horizontally into the air to get his head to a long pass from left back Daley Blind, sending the ball arching over stranded Spain goalkeeper and captain, Iker Casillas. Spain never recovered, booking early passage home by losing that match 5-1, and its next game to Chile.